Thiruvananthapuram, India, will host a tattoo festival this weekend – the city’s very first. Russell Van Buerle, a popular tattoo artist from Bangalore, along with his studio’s team, will be at Café Coffee Day from December 5 to 7 giving tattoos to the willing. Click here to read the hilariously worded press release. 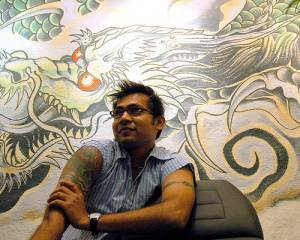 Thiruvananthapuram’s tattoo festival is a reflection of India’s changing attitudes towards tattooing. Once considered taboo, tattooing in India has moved into the mainstream, thanks to Bollywood stars such as Saif Ali Khan, Esha Deol (that’s her at the top of this post), Amrita Arora, Mallaika Arora Khan, Sanjay Dutt, Apoorva Lakhiya and Mandira Bedi. These megastars have made tattoos popular for India’s youth and more and more tattoo shops are popping up in the country to cash in on the growing trend. This (unfortunate but unsurprising) has meant that there are a ridiculous number of scratchers performing shoddy tattoos, looking to take advantage of the country’s lack of regulations governing the practice and make some easy cash (check this how-to out and cringe). There are a few truly reputable artists in India (like Patange, Van Buerle and Pradeep Menon) who are professionally trained artists using top-of-the-line vegetable-based FDA-approved imported dyes and sterile, hygienic, new equipment. These guys are doing what they can to educate the general public so that people can make informed tattoo decisions, which is always a good thing, no matter where you are in the world.